While other online poker rooms have seen their fortunes rapidly rise and fall over the years, 888 has basically known only one direction since the online poker room launched nearly a decade ago: Up. The room has grown steadily, year after year, winning a loyal and broad player base with a superior mix of social features, game selection and generous promotions for just about everyone playing at the site. For those learning about the poker room at 888 for the first time, and for experienced players who may be giving the site a second look, we offer this compact review of 888 Poker. What Poker Games Can I Play at 888 Poker? 888 ranks as one of the top five online poker rooms in the world when it comes to real-money traffic. A ranking that strong basically guarantees you that you'll find the game you want at the limit you want nearly any time of day, whether you're looking to play cash games or tournaments. For cash game players, the lobby at 888 is made up of Texas Hold'em, Pot Limit Omaha, Omaha Hi/Lo and 7 Card Stud Tables, with No Limit Hold'em accounting for approximately 85% of games running at any given time. Stakes for games span a broad range, from .01/.02 blinds at the bottom to $100/$200 blinds at the top. The majority of cash game action takes place in the micro-stakes and low-stakes areas of the room, but high stakes games do run on a regular basis. Tournament players will find a similar story in their part of the lobby, with no limit MTTs and SNGs featuring buy-ins of $100 or less making up the bulk of tournament offerings at 888. How Tough Are the Games on 888? While game toughness is always going to be somewhat relative to the individual, 888 Poker easily earns a high grade from us when it comes to the general softness of their games. This grade is based both on personal experience and a survey of the typical player at the room; since 888 has such strong mainstream marketing in so many unique international markets and so many promotions geared to casual players, the average opponent you'll find is simply going to be a bit weaker than at a room more focused on catering to high-volume and professional online poker players. 888 is one of the easier to beat poker sites. Another area where 888 shines. If you can think of a way to play online poker, chances are that 888 has a compatible version of its poker room available. Players looking to use their mobile device to play poker online can choose from 888 Poker's Android app or the 888 app designed for the iPhone and iPad. 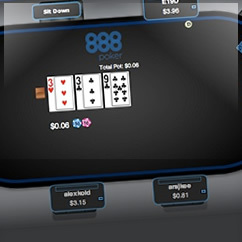 888 Poker also offers a no download version of their software, which means you can play 888 on your Mac without a problem - in fact, the browser-based version of 888 ensures that you can visit the room on just about any device that has a browser, including Linux, Ubuntu and other exotic operating systems. With this mix of software for desktop, Mac, Linux, Android and Apple devices, 888 Poker meets or exceeds the offerings of any other major online poker operator, earning our top grade for compatibility. 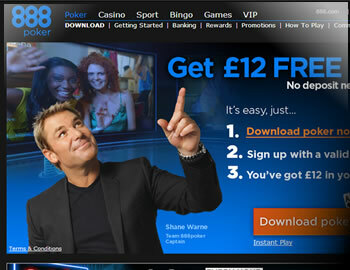 The minimum deposit at 888 Poker is $10/€10/£10 for almost all payment methods. 888 Poker accepts literally dozens of payment methods, including PayPal, Skrill, credit cards, bank transfers and pre-paid cards. Deposit processing times at 888 are fairly standard, with most methods having a delay of less than a day (new accounts may see longer delays due to security procedures). Withdrawals have a time frame of 1-2 days for most major e-wallets and under a week for the majority of other methods. Those with higher status in the 888 Poker VIP Program may qualify for accelerated cashout times. As with most online poker rooms, 888 requires that you cash out first by the method used to deposit (when possible). On to the more important part for many players: 888 Poker has an impeccable reputation when it comes to banking. Players report satisfaction with depositing and withdrawals, and the company has no history of extensive payment delays, missed payments or anything resembling a similar problem. Based on that history, 888 receives our highest grade possible for banking integrity and security. Is it Legal to Play on 888 Poker? 888 is a fully licensed and legal online poker room. The approach of the room is to only operate in jurisdictions where the legality of online poker is not in question. In addition to the main poker room, licensed by well-regarded regulator Gibraltar, 888 has won regulatory approval in the Spanish, French and Italian markets and operates several global partnerships with leading US gambling giants such as Caesar's and WMS. In short, 888 is highly scrupulous when it comes to operating legally, so if the room accepts players from your country you can feel confident that playing online poker at 888 is well within the law.